To understand more of how Pythagoras works we are using this stock as an example. 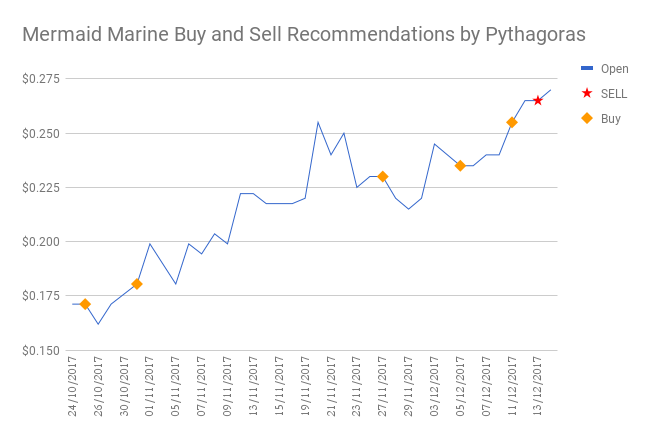 We have 5 buy recommendations at an average of 21.7 cents and a sell at 26.5 cents. A handsome profit of 28.5 cents. That is a return of invested capital of 26% in less than 2 months. MMA Offshore Limited provides marine logistics and supply base services to the offshore oil and gas industry in Australia and internationally. The company engages in a range of offshore marine activities, including FPSO offtake support; construction support; survey support; dive and ROV support; subsea installation support; subsea inspection, maintenance, and repair; and tug and barge operations, as well as supply operations comprising drilling and production. It also offers slipway facilities to third party operators comprising routine and emergency dockings, mobilisations, and other marine repairs and maintenance services. In addition, the company operates onshore facilities that build commercial and customized offshore support vessels; and focus on vessel mobilizations and demobilizations. It owns and operates approximately 40 vessels. No one really wants to acknowledge that they sit on the reactionary side of trading but it’s something most investors have in common. Investment decisions are usually a reaction to an event. This is where every investor, big or small, comes unstuck. Trying to react after the horse has bolted is a flawed investment strategy. How do you overcome trading after the event? Unless you are capable of analysing the mountains of data, you’re in for a tough emotional rollercoaster trading stocks. How much of your time do you dedicate to researching and predicting stock prices? Whatever the answer is, its never enough. What if you traded before the event? How about buying before or at the start of a price rise? What about selling when the price is about to peak before the downturn? All with mathematical precision. Pythagoras is looking when everyone else isn’t. And it’s doing more that the human mind can – without prejudice and human emotion. 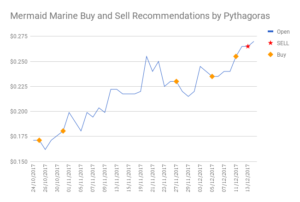 Simply put, Pythagoras is mathematically looking at stocks and predicting events through changes in volatility. We then predict share price behaviour – and trade ahead of the events. 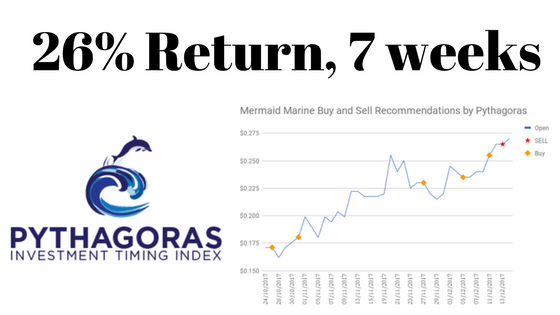 We are not scared of volatile markets as Pythagoras mathematically performs at its best in difficult markets. There is no need for fear! It predicts the events and buys or sells ahead of them! Buy signals with a price and timing, and sell signals with timing! Our predictive technology takes a complex snapshot of each stock’s historic performance and measures volatility, allowing us to predict events that will affect the stock price. ← Cryptocurrency- has NOT gone bang yet!